Rudolf Carnap (German: ; May 18, 1891 – September 14, 1970) was a German-born philosopher who was active in Europe before 1935 and in the United States thereafter. He was a major member of the Vienna Circle and an advocate of logical positivism. Carnap's father had risen from the status of a poor ribbon-weaver to become the owner of a ribbon-making factory. His mother came from academic stock; her father was an educational reformer and her oldest brother was the archaeologist Wilhelm Dörpfeld. As a ten-year old, Carnap accompanied his uncle on an expedition to Greece. He began his formal education at the Barmen Gymnasium. 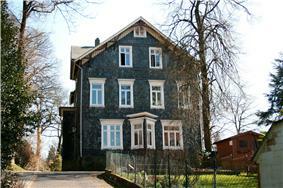 From 1910 to 1914, he attended the University of Jena, intending to write a thesis in physics. But he also studied carefully Kant's Critique of Pure Reason during a course taught by Bruno Bauch, and was one of very few students to attend Gottlob Frege's courses in mathematical logic. While Carnap held moral and political opposition to World War I, he felt obligated to serve in the German army. After three years of service, he was given permission to study physics at the University of Berlin, 1917–18, where Albert Einstein was a newly appointed professor. Carnap then attended the University of Jena, where he wrote a thesis defining an axiomatic theory of space and time. The physics department said it was too philosophical, and Bruno Bauch of the philosophy department said it was pure physics. Carnap then wrote another thesis, with Bauch's supervision, on the theory of space in a more orthodox Kantian style, and published as Der Raum (Space) in a supplemental issue of Kant-Studien (1922). In it he makes the clear distinction between formal, physical and perceptual (e.g., visual) spaces. Frege's course exposed him to Bertrand Russell's work on logic and philosophy, which put a sense of the aims to his studies. He accepted the effort to surpass traditional philosophy with logical innovations that inform the sciences. He wrote a letter to Russell, who responded by copying by hand long passages from his Principia Mathematica for Carnap's benefit, as neither Carnap nor his university could afford a copy of this epochal work. In 1924 and 1925, he attended seminars led by Edmund Husserl, the founder of phenomenology, and continued to write on physics from a logical positivist perspective. Carnap discovered a kindred spirit when he met Hans Reichenbach at a 1923 conference. Reichenbach introduced Carnap to Moritz Schlick, a professor at the University of Vienna who offered Carnap a position in his department, which Carnap accepted in 1926. Carnap thereupon joined an informal group of Viennese intellectuals that came to be known as the Vienna Circle, directed largely by Moritz Schlick and including Hans Hahn, Friedrich Waismann, Otto Neurath, and Herbert Feigl, with occasional visits by Hahn's student Kurt Gödel. When Wittgenstein visited Vienna, Carnap would meet with him. He (with Hahn and Neurath) wrote the 1929 manifesto of the Circle, and (with Hans Reichenbach) initiated the philosophy journal Erkenntnis. The Logical Structure of the World (German: "Der logische Aufbau der Welt"), in which he developed a rigorous formal version of empiricism, defining all scientific terms in phenomenalistic terms. The formal system of the Aufbau (as the work is commonly termed) was grounded in a single primitive dyadic predicate, which is satisfied if "two" individuals "resemble" each other. The Aufbau was greatly influenced by Principia Mathematica, and warrants comparison with the mereotopological metaphysics A. N. Whitehead developed over 1916–29. It appears, however, that Carnap soon became somewhat disenchanted with this book. In particular, he did not authorize an English translation until 1967. Pseudoproblems in Philosophy asserted that many philosophical questions were meaningless, i.e., the way they were posed amounted to an abuse of language. An operational implication of this opinion was taken to be the elimination of metaphysics from responsible human discourse. This is the statement for which Carnap was best known for many years. In February 1930 Tarski lectured in Vienna, and during November 1930 Carnap visited Warsaw. On these occasions he learned much about Tarski's model theoretic method of semantics. Rose Rand, another philosopher in the Vienna Circle, noted, "Carnap's conception of semantics starts from the basis given in Tarski's work but a distinction is made between logical and non-logical constants and between logical and factual truth... At the same time he worked with the concepts of intension and extension and took these two concepts as a basis of a new method of semantics." In 1931, Carnap was appointed Professor at the German language University of Prague. There he wrote the book that was to make him the most famous logical positivist and member of the Vienna Circle, his Logical Syntax of Language (Carnap 1934). In this work, Carnap advanced his Principle of Tolerance, according to which there is not any such thing as a "true" or "correct" logic or language. One is free to adopt whatever form of language is useful for one's purposes. In 1933, W. V. Quine met Carnap in Prague and discussed the latter's work at some length. Thus began the lifelong mutual respect these two men shared, one that survived Quine's eventual forceful disagreements with a number of Carnap's philosophical conclusions. Carnap, whose socialist and pacifist beliefs put him at risk in Nazi Germany, emigrated to the United States in 1935 and became a naturalized citizen in 1941. Meanwhile back in Vienna, Moritz Schlick was murdered in 1936. From 1936 to 1952, Carnap was a professor of philosophy at the University of Chicago. During the late 1930s, Carnap offered an assistant position in philosophy to Carl Gustav Hempel, who accepted. The two conducted research including Logical Syntax  Thanks partly to Quine's help, Carnap spent the years 1939–41 at Harvard, where he was reunited with Tarski. Carnap (1963) later expressed some irritation about his time at Chicago, where he and Charles W. Morris were the only members of the department committed to the primacy of science and logic. (Their Chicago colleagues included Richard McKeon, Mortimer Adler, Charles Hartshorne, and Manley Thompson.) Carnap's years at Chicago were nonetheless very productive ones. He wrote books on semantics (Carnap 1942, 1943, 1956), modal logic, being very similar in Carnap (1956) to the now-standard possible worlds semantics for that logic Saul Kripke proposed starting in 1959, and on the philosophical foundations of probability and induction (Carnap 1950, 1952). After a stint at the Institute for Advanced Study in Princeton, he joined the philosophy department at UCLA in 1954, Hans Reichenbach having died the previous year. He had earlier refused an offer of a similar job at the University of California, because accepting that position required that he sign a loyalty oath, a practice to which he was opposed on principle. While at UCLA, he wrote on scientific knowledge, the analytic – synthetic dichotomy, and the verification principle. His writings on thermodynamics and on the foundations of probability and induction, were published posthumously as Carnap (1971, 1977, 1980). Carnap taught himself Esperanto when he was 14 years of age, and remained sympathetic to it (Carnap 1963). He later attended the World Congress of Esperanto in 1908 and 1922, and employed the language while traveling. Carnap had four children by his first marriage to Elizabeth Schöndube, which ended in divorce in 1929. He married his second wife, Elizabeth Ina Stögner, in 1933. Ina committed suicide in 1964. Carnap's Logical Syntax of Language can be regarded as a response to Wittgenstein 's Tractatus. Carnap elaborated and extended the concept of logical syntax proposed by Wittgenstein in the Tractatus (Section 3.325). However, Wittgenstein stated that propositions cannot represent logical form. In the U.S, the concept of logical syntax helped the development of natural language processing and compiler design. The purpose of logical syntax is to provide a system of concepts, a language, by the help of which the results of logical analysis will be exactly formulable. Carnap wanted only to end metaphysics but not philosophy. Carnap, in his book Philosophy and Logical Syntax, used the concept of verifiability to reject metaphysics. Carnap used the method of logical analysis to reject metaphysics. For links to Carnap's publications and discussions of his work, see Carnap" in All Fields of Study""". Microsoft Academic Search. Retrieved 2013-05-26. 1945. On Inductive Logic in Philosophy of Science, Vol.12, p. 72-97. 1945. The Two Concepts of Probability in Philosophy and Phenomenological Research, Vol.5, No.4 (Jun), p. 513-532. 1947. On the Application of Inductive Logic in Philosophy and Phenomenological Research, Vol. 8, p. 133-148. 1950. Logical Foundations of Probability. University of Chicago Press. Pp. 3–15 online. 1950. "Empiricism, Semantics, Ontology", Revue Internationale de Philosophie 4: 20–40. 1963, "Intellectual Autobiography" in Schilpp (1963: 1–84). 2000. Untersuchungen zur Allgemeinen Axiomatik. Edited from unpublished manuscript by T. Bonk and J. Mosterín. Darmstadt: Wissenschftliche Buchgesellschaft. 167 pp. ISBN 3-534-14298-5. Online bibliography. Under construction, with no entries dated later than 1937. ^ a b Quine, W.V. and Rudolf Carnap (1990). Dear Carnap, Dear Van: The Quine-Carnap Correspondence and Related Work. Berkeley, CA: University of California Press. p. 23. ^ Rand, Rose. "Reading Notes and Summaries on Works by Rudolph Carnap, 1932 and Undated". Rose Rand Papers. Special Collections Department, University of Pittsburgh. Retrieved May 16, 2013. ^ Carnap, Rudolf. 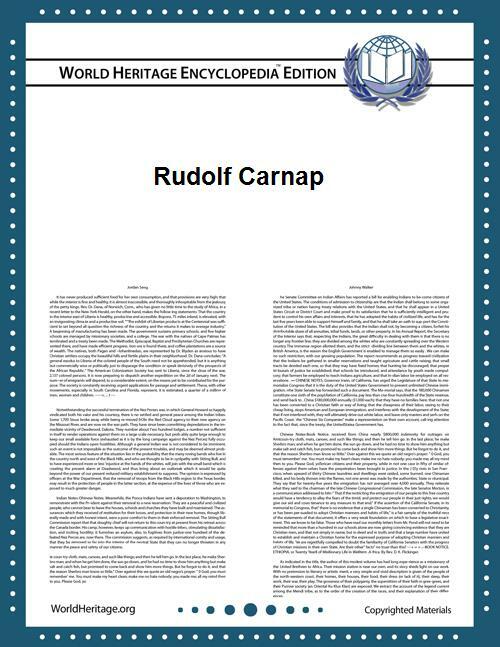 "Rudolf Carnap Papers". Special Collections Department, University of Pittsburgh. Retrieved September 17, 2013. Richard Creath, Michael Friedman, ed. (2007). The Cambridge companion to Carnap. Cambridge University Press. Roger F Gibson, ed. (2004). The Cambridge companion to Quine. Cambridge University Press. Thomas Mormann, 2000. "Rudolf Carnap" (book). München, Beck. 1951, Two Dogmas of Empiricism. The Philosophical Review 60: 20–43. Reprinted in his 1953 From a Logical Point of View. Harvard University Press. 1985, The Time of My Life: An Autobiography. MIT Press. 1991. Logic, Language, and the Structure of Scientific Theories: Proceedings of the Carnap-Reichenbach Centennial, University of Konstanz, May 21–24, 1991. University of Pittsburgh Press. Wagner, Pierre, ed., 2009. Carnap's Logical Syntax of Language. Palgrave Macmillan. Wagner, Pierre, ed., 2012. Carnap's Ideal of Explication and Naturalism. Palgrave Macmillan. R. Carnap: "Von der Erkenntnistheorie zur Wissenschaftslogik", Paris Congress in 1935, Paris, 1936. R. Carnap: "Über die Einheitssprache der Wissenschaft", Paris Congress in 1935, Paris, 1936. R. Carnap: "Wahrheit und Bewährung", Paris Congress in 1935, Paris, 1936. Das Fremdpsychische bei Rudolf Carnap (German) by Robert Bauer. Luchte, James, 2007. "Martin Heidegger and Rudolf Carnap: Radical Phenomenology, Logical Positivism and the Roots of the Continental/Analytic Divide," Philosophy Today, Vol. 51, No. 3, 241–260.